AbeBooks is an online marketplace for books. AbeBooks offers millions of new, used, rare, and out-of-print books from thousands of booksellers around the world. In AbeBooks’ inventory of millions of books, readers find bestsellers, collectors find rare books, students find textbooks, and bargain hunters find books discounted up to 90%. AbeBooks offer history Feb	2016 Apr	2016 Jul	2016 Oct	2016 Jan	2017 Apr	2017 Jul	2017 Oct	2017 Jan	2018 Apr	2018 Jul	2018 Oct	2018 Jan	2019 Apr	2019 Offer Bookseller Sales at AbeBooks - Up to 50% off! Bookseller Sales at AbeBooks - Up to 60% off! 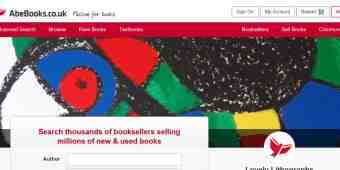 Bookseller Sales at AbeBooks - Up to 30% off Bookseller Sales at AbeBooks - Up to 20% off Bookseller Sales at AbeBooks - Up to 35% off Bookseller Sales at AbeBooks - Up to 40% off Sell Your Books with AbeBooks from £17 (+tax) / month!